This day, 30 September, has been declared International Translation Day by UNESCO and the International Federation of Translators. The date was chosen because it's the feast of St. Jerome. I ought to write something original for the occasion, but as my thoughts are elsewhere at the moment I'll repeat, with a few tweaks, a post that appeared in this blog on a previous 30 September some years ago. Today is the feast of St. Jerome, the patron saint of translators. He was born in Dalmatia in 347. He's the patron of Professional Expert Translators, that is, because he had to be a multilingual expert for his work on translating the Bible (the so-called Vulgate version) and he was a professional in that he was commissioned to do it by Pope Damasus I. That’s why associations of professional translators around the globe celebrate today as International Translation Day. It’s perhaps ethnocentric to choose the feast of a Christian saint for International Translation Day, but never mind, for he was a great translator. Furthermore, he had definite views about translating and he put them into a long epistle defending them, his Letter to Pammachius on the Best Method of Translating. Not only do I admit, but I proclaim at the top of my voice, that in translating from Greek, except from Sacred Scripture, where even the order of the words is of God’s doing, I have not translated word for word, but sense for sense. People focus now on the last part of the pronouncement (putting meaning before words) because it supports the popular norm for 'good' translation; but in religious translating "God's doing" is also important. It explains why many Muslims are against any translation at all of the Koran. Today I reflect, therefore, that we’re commemorating a religious translator. I’ve long been dismayed at the lack of interest shown in this branch of translation by our university professors of translation studies. When they introduce it into their graduate programmes, they usually treat it historically and ignore its continued contemporary vibrancy, which among other things has given us Eugene Nida’s classic Toward a Science of Translating. A great many of them are concerned these days with the cultural causes and effects of literary translation, but don’t they realize that religious translation has had an even greater impact on culture? Why so? Because religion moves the masses. From my 20 years at the University of Ottawa, I can only recall one thesis on the Bible or any other religious translation – and that was on St. Jerome. We were once approached by the Wycliffe organization of Bible translators to host a summer school for them, and none of my colleagues was interested. So I think I may return to the topic, because it has many connections with Non-professional Translation. But to conclude, here’s an old Canadian joke. Well the old man, who was probably a Protestant anyway, certainly didn’t know about Jerome’s Catholic Latin. But the point of the story is, of course, that many people aren’t even aware that the Bible they are reading is a translation – far less that it’s often the translation of a translation. Indeed it’s always a translation of a translation in part: Christ, for example, spoke in Aramaic and his words were translated into Greek and from there to Latin and from Latin to the European vernaculars, and from those to the indigenous languages spoken in the colonies, so on. It may well be the longest of all the chains of ‘relayed’ translations, and there have been important spin-offs from it like the invention of writing systems by missionaries for languages that didn’t have one. At Paul's behest, Christ's disciples had to interpret into the languages of the nascent Christian communities, and they were assuredly not professionals.. Someone might well do a survey of people’s awareness of it. The labour is one of love, but at the same time both perilous and presumptuous; for in judging others I must be content to be judged by all; and how can I dare to change the language of the world in its hoary old age, and carry it back to the early days of its infancy? Is there a man, learned or unlearned, who will not, when he takes the volume into his hands, and perceives that what he reads does not suit his settled tastes, break out immediately into violent language, and call me a forger and a profane person for having the audacity to add anything to the ancient books, or to make any changes or corrections therein? I was introduced to Jerome’s Letter to Pammachius through the English translation made in the 70s by my Ottawa colleague Louis Kelly, who now lives in retirement in Cambridge, England. Unfortunately that translation is not now available, but Kelly discusses the Letter in his book The True Interpreter: A History of Translation Theory and Practice in the West, which is on sale at www.amazon.co.uk. Eugene A. Nida (American Bible Society). Toward a Science of Translating / With special reference to principles and procedures involved in Bible translating. Leiden: Brill, 1964. 331 p.
Available free online at Scribd. 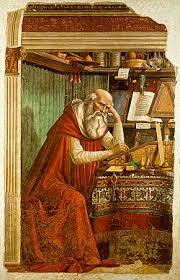 Saint Jerome in his study by Domenico Ghirlandaio (1448-1494). Source:Wikipedia. A friend in Paris has sent me a recent article from an unexpected source, The New Yorker. It's by one of their well-known staff writers Judith Thurman and its title is The mystery of people who speak dozens of languages. In what follows I will try to dispel some of the mystery. * According to Pliny the Elder, the Greco-Persian king Mithridates VI, who ruled twenty-two nations in the first century B.C., administered their laws in as many languages, and could harangue in each of them. * Plutarch claimed that Cleopatra very seldom had need of an interpreter, and was the only monarch of her Greek dynasty fluent in Egyptian. * Elizabeth I also allegedly mastered the tongues of her realm—Welsh, Cornish, Scottish, and Irish, plus six others [including the language of her enemy, Spanish]. * The prowess of Giuseppe Mezzofanti (1774-1849) is more astounding and better documented. 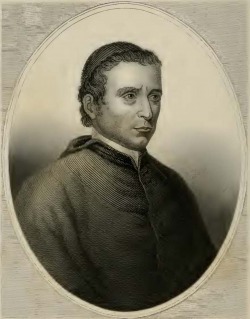 Mezzofanti, an Italian cardinal, was fluent in at least thirty languages and studied another forty-two, including, he claimed, Algonquin. In the decades that he lived in Rome, as the chief custodian of the Vatican Library, notables from around the world dropped by to interrogate him in their mother tongues, and he flitted as nimbly among them as a bee in a rose garden. * Thurman misses out the 18th-century English orientalist and translator Sir William Jones, who was reputed to know 26 languages. Those were champions, so-called hyperglots. Their achievement was the fruit of many years of learning. But scarcely less remarkable is the achievement by the little girl Bella Devyatkina who was described last month on this blog and who could converse in seven languages at the age of four. Yet the underlying reason why all of them could do what they did is the same. It's that human psychology and the physical human brain are built from infancy, perhaps from birth, for multilingualism (bilingualism being a special case of multilingualism and not the other way round.) Bella's mother insists that her daughter, for all her precocity, is not a genius. It's just that she has been put in situations and relationships where she responds to the motivation of receiving a present from speakers of other languages. Scientists and philosophers agree that language is one of the marvels of human evolution, No other animals have anything comparable. To it has been added another evolutionary marvel: the ability to learn multiple languages. The examples quoted above suggest that in principle there is no limit to their number. Yes, there are practical limits; the time we can devote to learning them and the length of our lives for instance, and the amount of contact we have with other-language speakers . And there are also psychological constraints, in particular motivation, without which we may be unwilling to work at it. But not the structure of our minds. a) Keep the languages separate. Actually very young bilinguals are prone to mixing their languages in the same sentence or utterance, a phenomenon linguists call code switching. Typically this weakness disappears around age three, but vestiges of it remain throughout life. We multilinguals are all used to occurrences of leakage or interference between our languages; for instance the common phenomenon of false friends. However, they dwindle to a frequency where they don't hamper communication. Just how the separation is maintained is a matter of disagreement. Some psycholinguists believe we keep our languages in separate drawers, as it were, and take them out and activate them as we need them. Others think that on the contrary they are all present in our working minds but we suppress the ones we don't need at the moment. b) Switch between the languages. This may be done at will and almost instantaneously; or the switch may be triggered automatically by a stimulus, for instance when answering a question in the language in which it is asked. c) Use the languages appropriately to express the thoughts we want to convey or to understand what others are telling us. It may be, however, that we aren't equally competent at this in all our languages; it depends very much on the experience we've had in using them. d) Use the languages in ways that are appropriate for the speaker/writer and for the addressee. For more about it and the weakness of machine translation in this respect, enter pragmatics in the Search box on the right. There are several ways in which we can learn languages. For example, "Mezzofanti, the son of a carpenter, picked up Latin by standing outside a seminary, listening to the boys recite their conjugations." I learnt my mother language, English, unconsciously and effortlessly from birth as I'm sure you did; three languages (French, German, Latin) in compulsory formal courses at school from age 11; one (Arabic) in formal university courses from age 18 because I was interested in it and thought it would help me get a job; and two others later (Spanish and Valencian) without ever taking a course in them but from elementary teach-yourself books and everyday conversation with native speakers with whom I was working. Apart from English, age had little to do with it. If I went to live in another country, even at my advanced age, I wouldn't hesitate to learn its language. Of course, as with any natural skill, there is a pathology: a minority of people may have learning problems, and language learning becomes more difficult, requires more conscious effort, once the stage of early plasticity is passed. It has seemed to me, though, that most of my English and Canadian compatriots who say they can't learn a foreign language are like people who don't learn to swim because they're afraid of the water. Judith Thurman. The mystery of people who speak dozens of languages. The New Yorker, 3 September 2018. My thanks to Philippe Lambert for sending it. 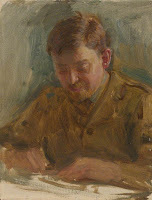 William Jones (philologist). Wikipedia, 2018.